Chalet Chantelle is a beautiful cosy chalet sleeping 14/16 people comfortably. This is a fully catered chalet serving quality food and wine and our staff offer a high level of service ensuring you have a wonderful and memorable stay. The chalet is located a short 5 minute walk from Morzine town centre. Ground floor has 1x double room with an ensuite shower and access to a bright terrace, a triple room (three single beds) with an ensuite bathroom and a small double/twin room with a ensuite shower. First floor - Main entrance which leads into an openplan lounge, dining, kitchen area with large windows and french doors allowing you to take in the stunning views. You access the garage from this floor which offers storage for ski equipment, heated boot dryers, bikes etc. From the lounge area French doors allow access to teh hot tub on a large deck area. Second floor - 1x double/twin room with an ensuite bathroom, 1x twin room with an ensuite bathroom, 1x triple room (three single beds) with an ensuite shower, 1x twin bedroom with an ensuite shower. All the bedrooms on the top floor have their own private balconies. Chalet Chantelle is perfectly situated in Morzine, a short walk into town, the nearest ski lift is about 500m away and there is a free ski bus stop just 50m away. 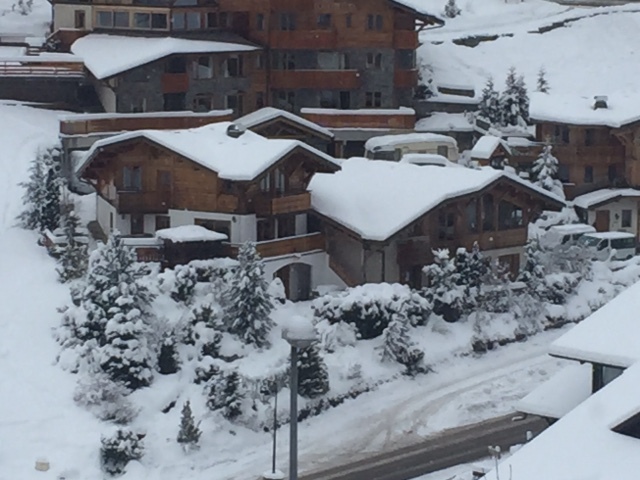 The chalet is run as a Catered chalet in the winter months and self catered during the summer months and it can be booked pre room or per full chalet just enquire for an accurate individual quote. The price quoted is based on two people sharing. Please contact us directly for a single person quote. During the summer when the property is self catered a £300 security deposit is taken with your balance payment, to cover any damages or breakage that may occur during your stay. This is returned to you after your stay. If you wish to book an individual room or a group of rooms please click here to complete the contact us form.